Tremblay plays August ‘Auggie’ Pullman, who was born with Treacher Collins Syndrome, which has left him with significant facial deformities. He’s been home-schooled by his mother (Julia Roberts), but will be going to mainstream school for the first time when he joins the fifth grade. Auggie is a shy and sensitive child, very aware of how others treat him because he looks different. Initially his worst fears are confirmed when he becomes the subject of schoolyard taunts and bullies, but he slowly begins to make connections. It’s also an adjustment for his mother and father (Owen Wilson), who want the best for their son but realise the difficulties he faces. There’s also his older sister, Via (Izabela Vidovic), who has long lived in the shadow of a brother who understandably has commanded much of her parents’ attention, but she is now a teenager looking for a life of her own. 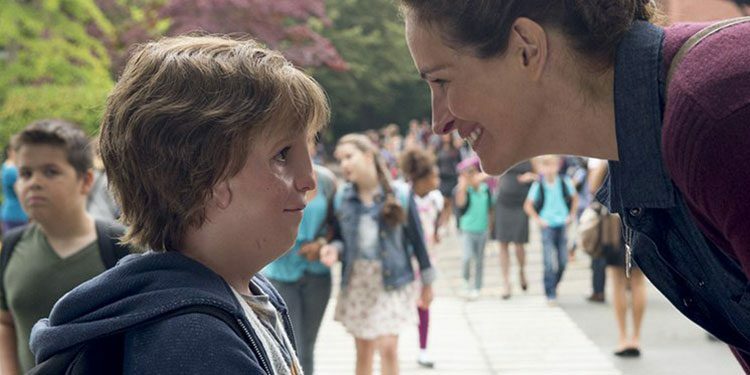 Wonder is a movie that is undoubtedly sentimental, but it manages to make a virtue of it. It’s essentially a film that’s about compassion and empathy, and from the beginning it lays out the importance of being kind to one another. It does this in a way that’s easily digestible for young kids, but also feels valid and worth repeating for adults. Thankfully it never feels like it’s pitying Auggie or painting him as a plaster saint – he’s just a little boy who’s sometimes a bit bratty and self-absorbed (as all kids can be), but just wants friendship and acceptance. It ensures that any parents wanting a movie that youngsters should enjoy and has some worthwhile lessons, should seek the film out. The film is structured so that it’s told from multiple viewpoints, which again underlines its themes of empathy and understanding. It’s particularly interested in the idea that it’s easy to misjudge someone’s motivations, and what seems simple could be more complex – whether it’s someone being overheard saying something mean, or an old friend distancing themselves. All this may make the film sound unbearably cloying and filled with the sort of twee, simplistic messages that are normally seen in pre-school programming, but it’s not. Stephen Chbosky’s script based on R.J. Palacio’s bestselling novel is a lot smarter than that. As with his adaptation of his own The Perks of Being a Wallflower, Chbosky has a real knack for getting to the heart of his characters and putting that across to the audience in a way that may trade in the tropes of sentimentality but feels real and doesn’t hide from the harsh edges of life. It just suggests that with the bad comes the good, and that much of the time outlook and understanding are the most important things and can pull you through. Overall Verdict: A charming, well-acted film that should be enjoyed by audiences of all ages. With plenty of worthwhile lessons and oodles of empathy, it’s a real charmer.